"The book provides tips to help board members overcome the fear of rejection and feel more comfortable asking for support." [The authors exploration of] " ..topics such as how to ask for a substantial gift and motivations for giving are especially effective." Robert M. Zimmerman is a fundraising specialist and president of Zimmerman Lehman. He has more than thirty years experience in the areas of fundraising, board and volunteer training and development, and executive search. Ann W. Lehman is a lawyer, planning specialist, executive coach, trainer, and policy expert. She has worked in the public interest arena for more than twenty-five years. 1. 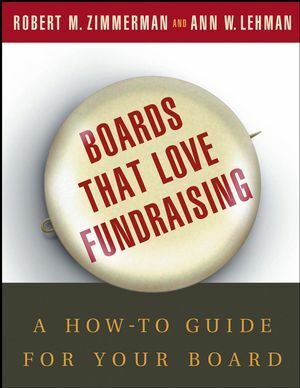 What Every Board Member Needs to Know to Start Fundraising. The Five Responsibilities of a Nonprofit Board. 2. Fundraising Rules Underlying Successful Appeals. People Love to Give Away Money. People Give Money to People. Fundraising from the Perspective of the Donor, Not the Applicant. People Give to Strength, Not Crisis. Specificity is Next to Godliness. Successful Fundraising Depends on Careful Record Keeping. Ten Percent of the People Give 90 Percent of the Money. Donors’ Gifts Must Be Recognized Immediately. 3. The Board’s Role in Specific Fundraising Activities. What the Board Needs to Understand About Fundraising Staff. What Development Staff Can and Cannot Do. Resource A: Major Donor Solicitation: Asking for the Gift. Resource B: Major Donor Solicitation Scripts.